Win A Monster Energy Survival Kit For Paid Dues 2013! Check out how you can win a free Monster Energy Survival Kit for the Paid Dues Festival 2013! 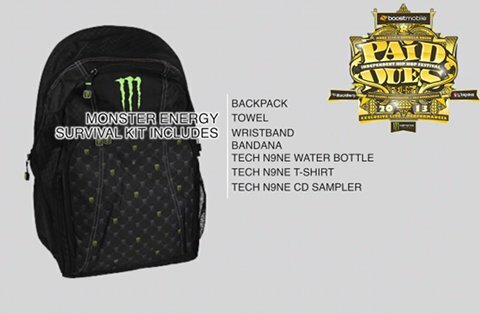 I want to win a @MonsterMusic Festival Survival Kit from @TechN9ne & @Paid_Dues! #SurvivePaidDueshttps://bit.ly/survivepaiddues. Contest ends Tue, 3/26 @ 11:59pm PST. Stay posted to www.paidduesfestival.com to see if you’re 1 of 50 lucky winners! What do you think about the prize package? What’s your favorite flavor of Monster?